For our 10th anniversary and my 50th birthday we decided to spend a couple of weeks traveling through Europe. That of course meant finding good running routes along the way. I joined Paul, who had been at a work event, in Vienna a couple of days before our anniversary. (Paul’s blog post looks at running in Vienna.) We decided to spend our anniversary in Budapest. This proved a good decision as it was both romantic and running friendly! And our hotel – a funky boutique place called the Bohem Art Hotel – was just the ticket. 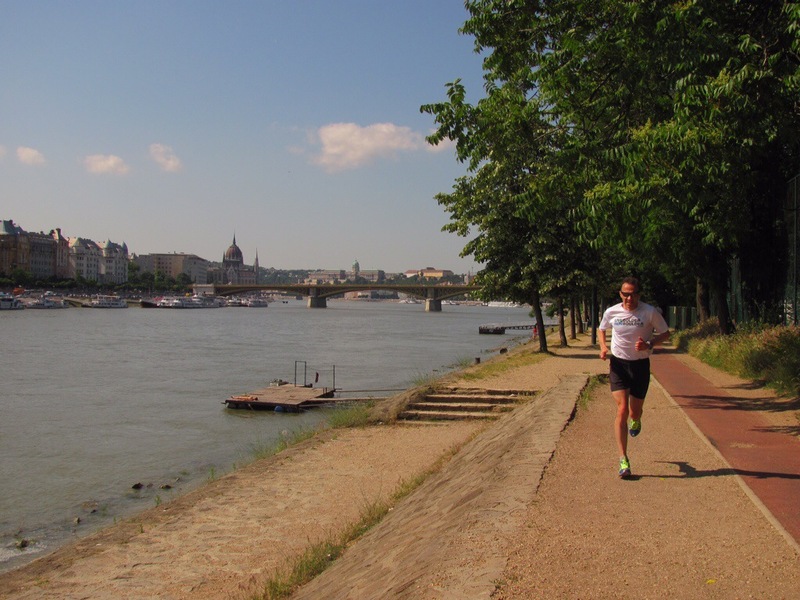 We found a great run that takes you along both the Buda and Pest sides of the Danube River to an island in the middle of the river dedicated to sporting activities. Along the way you run by or on four of Budapest’s eight best known bridges. Run across Liberty Bridge, the shortest bridge spanning the Danube River, towards the Buda side to get onto the cycle/pedestrian path. It’s a wide flat path but you share it with cyclists most of the way. Three miles along this path gets you to Margaret Island. View of Buda Castle and Palace complex. A mile along is Elisabeth Bridge, one of the more modern looking bridges along the Danube. Soon after you’ll see the historical Buda Castle and palace complex looking down on the town from its majestic perch perched atop Castle Hill. 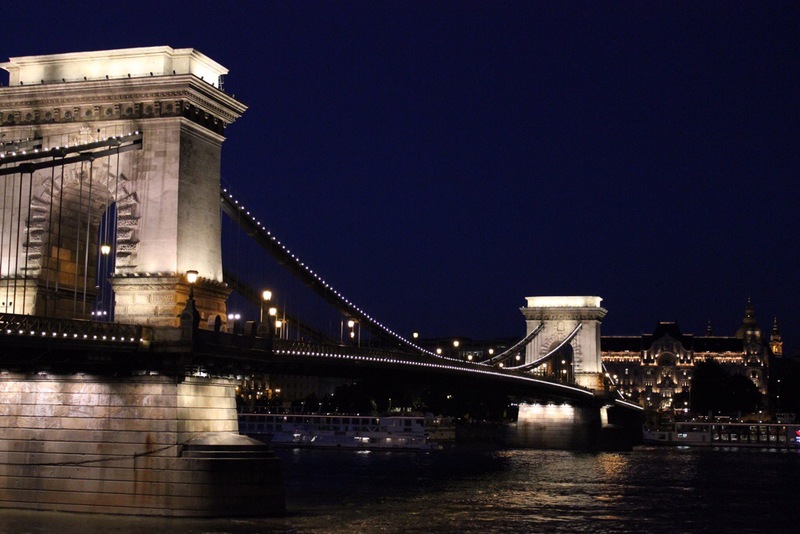 Another mile takes you to the most famous bridge in Hungary – Chain Bridge. When inaugurated in 1849 this bridge was the first permanent stone bridge connecting the Buda and Pest sides of the river and the second permanent crossing along the entire length of the Danube. Two stone lions guard each end of the bridge. Once you pass Chain Bridge the view gets interesting on the Pest side of the river. The impressive Budapest Parliament Building dominates this section. 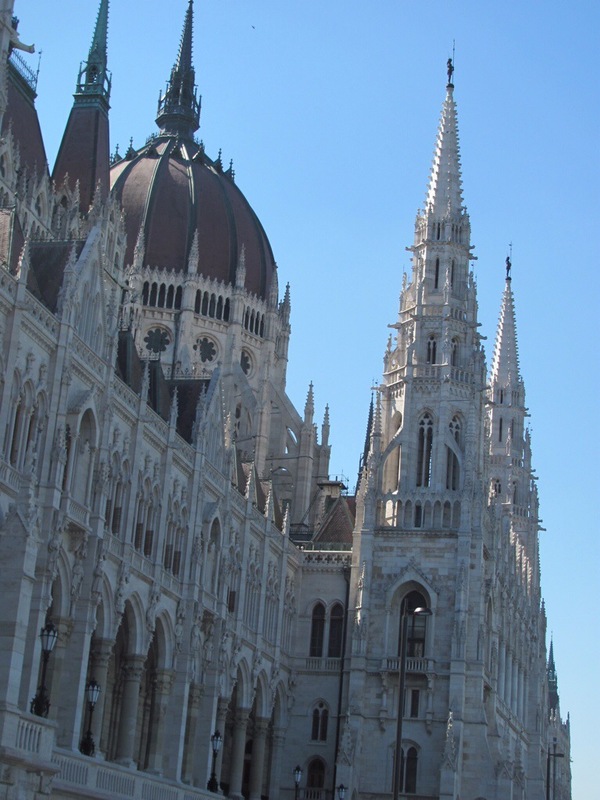 When completed in 1902 it was the largest parliament building in the world. It’s design was inspired by the Houses of Parliament in London but with its statues of Hungarian rulers, Gothic ornaments and intricately decorated spires it outshines London’s version. Especially at night when it gleams of golden light. 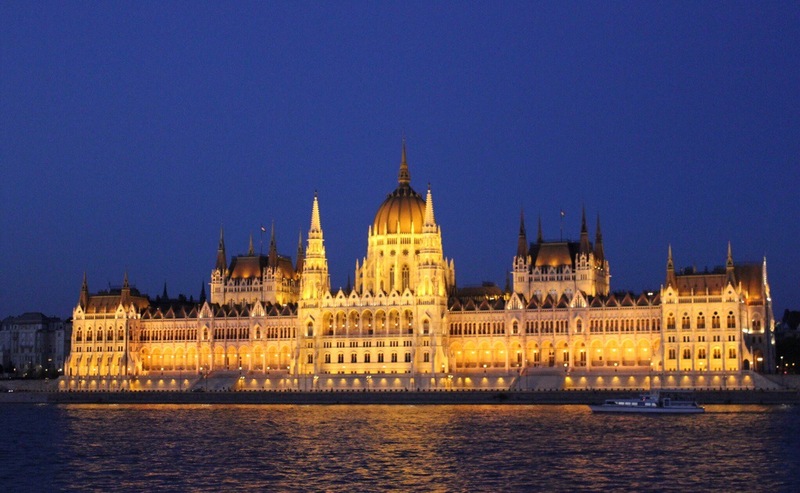 The Parliament Building is spectacular at night. The next bridge, Margaret Bridge, takes you to an island that’s a paradise for runners. It offers a 3.3 mile single lane all weather track around the circumference. Aside from a few worn patches it’s generally in good shape. Alongisde the track, on one side of the island is a tarmac path and on the other a sandy path which allows faster runners to pass. The island circuit is a unique way to take in the city’s architecture. On the Pest side as you head north stately old buildings quickly give way to high rise housing similar to the public housing in Singapore. Paul running on the sandy path next to the one-lane all weather track. Unexpectedly towards the north end of the island are several wellness resort hotels connected to hot springs. At the top end is a car park for those driving across Arpad Bridge..
One of the hotels on Margaret Island. At the top of the island the trail crosses a road and continues south offering views of houses dotting the hills on the Buda side. You soon come across a huge swimming pool complex catering for both serious swimmers and those simply splashing around. Close to the end of the circuit was a gym and tennis courts. What was most impressive was how many fit and fast runners there were – including some older than us. Many looked like triathletes – and if they were, they had the facilities right here for it. For a change of scene, and for me a slightly shorter route, I took the Pest side of the river back. The drawback to this side is that there is no dedicated cycle/pedestrian path so you have to put up with varied surfaces, some less runnable. The route will take you right in front of the Parliament Building where you have to run on cobble stones but the view makes up for the discomfort. View as you run right in front of the shadow of the Parliament Building. Along this route is a less visible but powerful work of art. 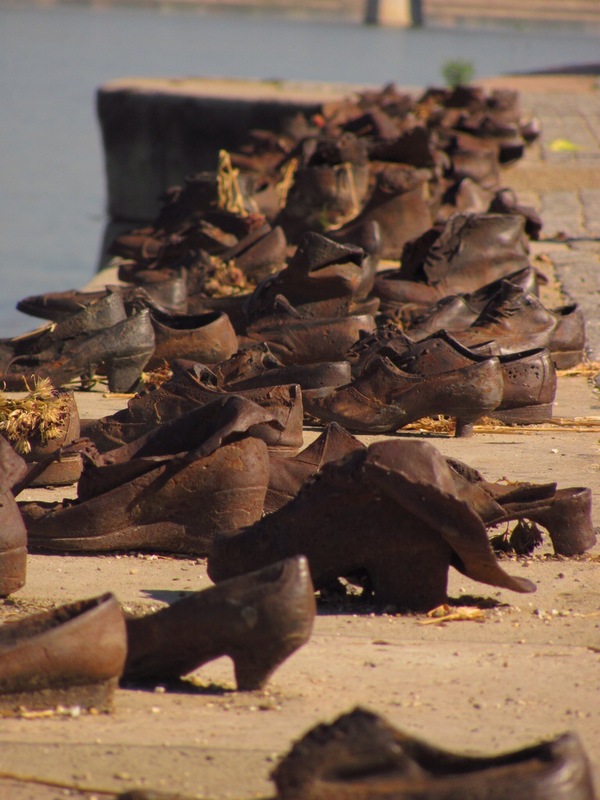 The Shoes on the Danube is a memorial honoring the Jews who were killed by fascist Arrow Cross militiamen in Budapest during World War II. They were ordered to take off their shoes and were shot at the water’d edge so that their bodies fell into the river to be swept away. Shoes on the Danube memorial. At the Chain Bridge one can cross the road to get onto an easier running surface. Heading down a promenade flanked by high end hotel restaurants and bars will get you most of the way to the starting point. After Elisabeth Bridge you’ll be running in the sidewalk past bars and restaurants with the end point in sight. 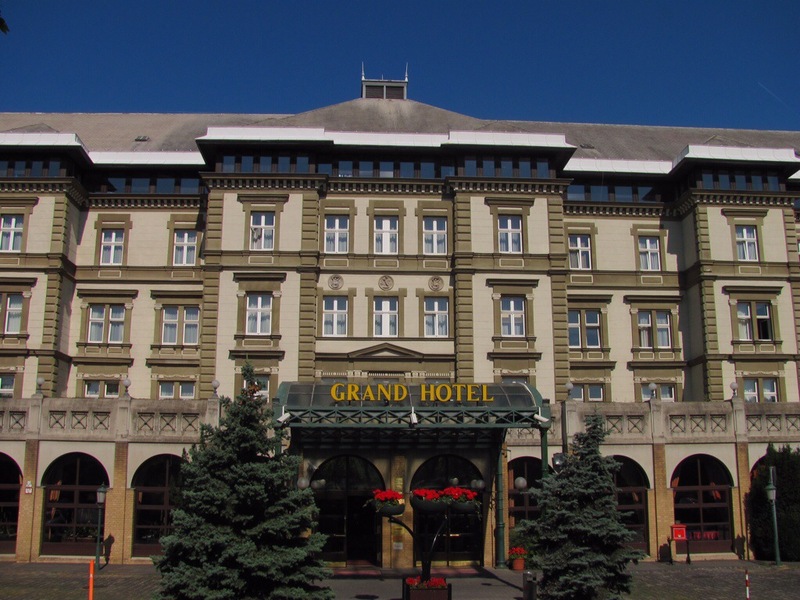 All in all an interesting way to see some of the key sights along the banks of the Danube – all in 7.5 miles. It can be easily shortened by starting at Chain Bridge or even at Margaret’s Bridge. Or lengthened by doing laps of the island and travelling back and forth along the Buda side of the river – as Paul did.